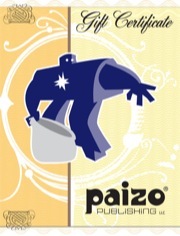 Purchase paizo.com gift certificates for friends and family! Gift certificates are redeemable for store credit which may be used to purchase anything we sell at paizo.com, excluding other gift certificates. That's more than 20,000 gaming products! You may create a gift message for each gift certificate. You can choose to provide your name or remain anonymous. You can choose to have gift certificates delivered to existing paizo.com customers—you'll need to specify their Avatar Name. They'll be sent an e-mail with your gift message (if any), and a link to their My Gift Certificates page where they may optionally print out a copy of their gift certificate, including your message. Gift certificates cannot be redeemed for cash. Unused store credit cannot be transferred or redeemed for cash. If an order exceeds the amount of available store credit, the balance must be paid with a credit card. Just in time. My list was a little too short. I'd like to suggest $10 and $20 gift cards. Small gifts have their place too! You can also select your own denomination from $5 to $500! Why is the Gift Certificate's checkout wanting to charge Sales Tax? If you pay sales tax when buying the gift and on when the person receiving the gift uses it - you pay sales tax twice. It also means Paizo may be double paying B&O taxes on gift certificates! Edit - referring to Washington State Sales tax. I purchased a certificate 10 minutes ago. The transaction shows up on my account page, but not on my gift certificates page. The credit card company shows that the transaction is pending. Is there merely a delay or is there an actual problem? It has been a problem for the last month or so. Just let the customer service people know about it and they will add it to your store credit...or whatever other fix you may need. Looks like Sharaya was able to address your email earlier. We're hoping to have this issue in general resolved Soon™. Hmmm, how is this supposed to work? I bought one a few days ago so i didn't have to keep doing a 4 dollar order for PFS scenarios, but I didn't get a code, and the new one isn't showing up under my account or my gift certificates. A bigger question is "why don't the confirmation emails send the gift certificate code?" Because of the bug (which has been present for what, a month or more? A long time in any event) if you buy a gift certificate it's *impossible* to redeem it, since the only place the code is visible is on the web. Can we get the certificate code added to the email that's sent when you buy a certificate? Seriously. Gift certificates have gone to /dev/null for at least two months now (I stopped going back in the posts when I hit the beginning of May) ... is anyone actually looking at this? I would think it would be kind of important. You *can* buy a gift certificate, and then redeem it yourself, right? If you want store credit? Yes Samy. I can confirm and done it many times. We just had an update and I believe you will find Gift Certificates working much more as intended now. Should you encounter any problems, let us know in the website feedback forum. I'm having the same issue as BigNorseWolf, I ordered a gift cert yesterday and I can't seem to find the code to redeem it anywhere. Can I get some help with this? The email you received should contain a link. Click on that link to get the redemption code. Nope, the only link in the e-mail that I got is the one that goes to the general gift certificates page. There's a link, but it just goes to the purchase gift certificate pages like it always used to. I looked at the e-mail source, but don't see any evidence of anything being missing. I will do a test at the end of the week. I just wanted to add I had a.problem about a month ago on a friday night. I gave my friend cash to use his credit card to buy a gift certificate because I wanted to buy PDFs. I use to buy prepaid cards but got tired of paying a fee, I made a.personal life choice to try to avoid ever using regular credit cards and easily fall into debt. I know I am being extreme but I am pleased with the results. So we did not get a redemption code and doubted we could get customer service on the weekend as those are not in there listed hours. On Monday, they handled us admirably. I am nit discouraged by this and will use the same technique again when the credit runs out. Another time a prepaid card with a balance above my order wad a problem. I encountered a few bumps in the road, but their customer service always took care.if me! You should now see the store credit available for your use. It looks like the order was placed before the new coding went live. Wait, wait, this thread serves an additional, very important, purpose. AM I TO UNDERSTAND THAT PAIZO HIRED CORT "CRAZY MOUSTACHE" ODEKIRK? 1. Yes, and that's "super fantastic mustache" thank you very much :). 2. On the gift certificates I should have been more specific. The link takes you to the process description for Gift Certificates. To get your redemption code go to "My Account" on the top header bar and look in the Gift Certificate section. There should be a button to "View, Print or Redeem Gift Certificates". Click that and you'll be taken to a page that should include a "Purchased Gift Certificates" section. Your redemption code will be there. This assumes you didn't specify a recipient. If so, they should receive an email with a link to their "My Gift Certificates" page, at which point everything works like above. Though I am kinda of disappointed that I won't have to do weekly requesting aid from the CS people. They are pretty nice people. I haven't yet figured out how to send a gift certificate to someone else. I really need the info today, it's his birthday. I'm sure LazarX figured it out, but (currently) to send gift certificate to someone else you click on the "Digital Gifts" tab at checkout (after adding the cert to cart), and then you need the messageboard alias (or possibly email) to locate your recipient.